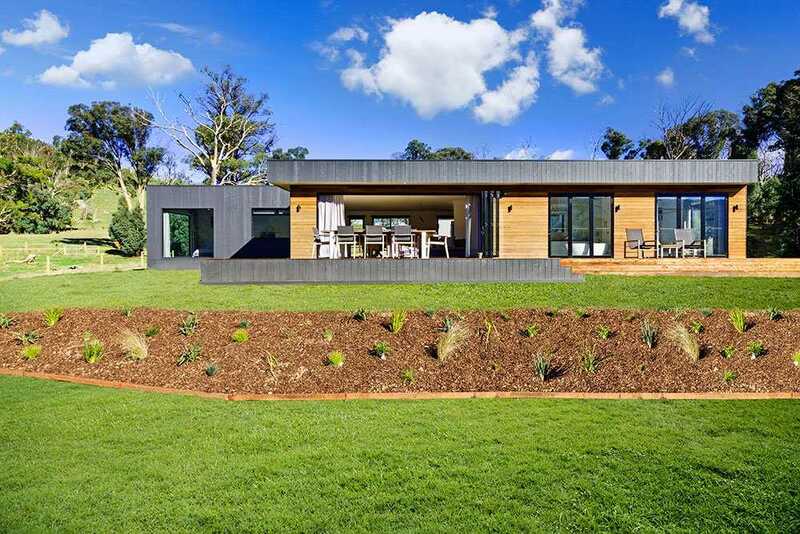 Beautiful in many ways, this stunning home in Buxton sits in the slope of the Yarra Valley, Victoria. Anchor Homes designed it to make the most of the surrounding views. This gorgeous house is the ideal blend of style and comfort. Let’s take a more in-depth look at the interior of this project. The first bedroom offers spectacular views through two large picture windows. While the second bedroom can also be used interchangeably as a home office or guest bedroom as needed. We can find the bedroom number 3 in a separate wing which offers privacy and includes access to the outside decking through bi-fold doors. All three bedrooms have carpet for warmth underfoot and built-in robes to keep things out of sight and organized. The large internal doors and high ceilings bring a sense of space and light to the entire home. In addition, the stunning bi-fold doors opening from the living area onto the large deck really bring the outdoors in, creating the perfect space to relax or entertain. The engineered oak flooring and inbuilt fireplace with wood storage add natural elements that bring warmth and comfort to space while maintaining the modern feel. Another highlight is the custom-built window seat which offers a lovely spot to gaze out at the views. As part of the open-plan living space, the kitchen and dining area provide a functional and stylish place to cook and enjoy a relaxed meal with family and friends. The kitchen features Caesarstone benchtops with waterfall ends, vinyl doors and a 90cm freestanding oven and cooktop. The undermount kitchen sink gives clean lines and a modern feel. Another thoughtful addition is the bronze kitchen tap. The bathroom also has the large bi-fold doors. It provides access to the external decking, as well as allowing in lots of natural light and more gorgeous views. The floor to ceiling tiles, walk-in shower, and sizeable free-standing bath are all practical and stylish and fit perfectly with the overall feel of the home. Outside, you can easily access the large decking through bi-fold doors from the living area, bathroom and bedroom three. This easy access makes it ideal for enjoying a quiet morning cuppa or hosting larger gatherings.